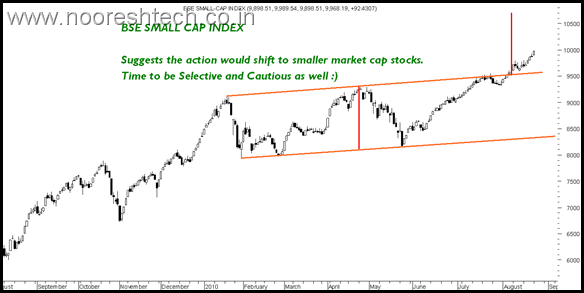 Small- Cap and Mid-Caps Rallied – Were you left looking at the Sensex !!! Just a month back when Sensex hit 18000 around 3rd week of July which was suggested way back at 16000 levels in a detailed presentation it was assumed that its time to sitback and be on sidelines. 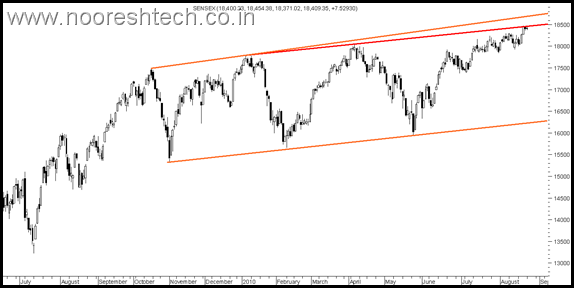 Well Sensex indicated a possibility of topping out or coming in a riskier zone! Even i was in the same camp and at one point of time we had gone on a high cash strategy !! But checking out the two Midcap and Small Cap Indices made me change the view from being on high cash to being Long Midcaps/SmallCaps with a Short on Nifty as a hedge worked superbly well. The Midcap and Small Cap indices zoomed 5-7% higher then the equivalent highs of 18k. Let us check the charts below to make the view clear. The index is up 10% from the highs made in April and 5-7% in last 1 month. Our focus on Midcap Banking Stocks – Lakshmi Vilas 80/98 to 125 , Dhanlaxmi 145 to 180, Karnataka Bank, Vijaya Bank, Uco Bank the list is endless !! Technically the target levels would suggest another 2-3% upside till 8000-8100 before a pause comes in but the point is we might be on the higher end !! Although Small Cap Index is still to catch up with the super run up in midcaps but we are seeing lots of unknown stocks up 20%. Although i try to cover lots of interesting Small Caps in my reports but even a speculative trade like Birla Cotsyn written at 0.9 is up to 1.45 on ckts with ads coming on newspapers and TV channels !! which is alarming. Technically though there might be lots of steam in smallcaps but one needs to be very selective and Stop LISTENING TO TIPS/INTERNAL news. 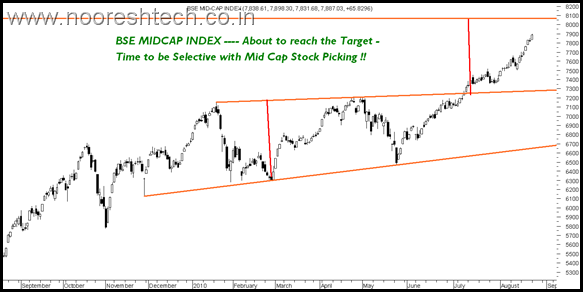 There is still some steam left in Midcaps/Smallcaps in near term. Although i would continue with my trading ideas but would suggest traders/investors to be stirct with stops as well as be selective as quality stocks will continue to perform ! !